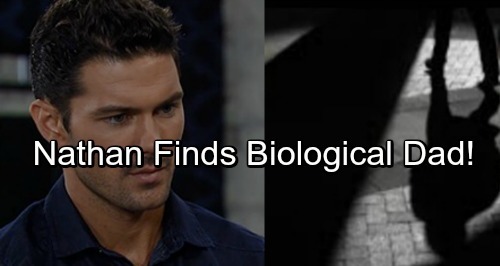 General Hospital (GH) spoilers tease that impending fatherhood will send Nathan (Ryan Paevey) down a dangerous path. He’s anxious to get his family medical records so he can fully prepare for his baby. Nathan just wants to make sure his son or daughter’s healthy and happy. He’ll undoubtedly be a great dad, but his search for answers will cause trouble. Nathan’s hoping Dr. Obrecht (Kathleen Gati) will supply all the info he needs, but she’ll prove to be less than forthcoming. General Hospital spoilers say Nathan will keep nagging Dr. O until she finally provides something. However, it looks like it won’t exactly be accurate – at least on his father’s side. Something may not add up when Nathan and Maxie (Kristen Storms) give the info to Kim (Tamara Braun). She might urge Nathan to check with the source of these records and get back to her. Whatever the case, Nathan will definitely grow suspicious over the next couple weeks. On December 20, General Hospital spoilers say a heated confrontation will get underway. Nathan will eventually call Dr. Obrecht out on her strange behavior. It won’t take him long to determine that secrets are being kept. Nathan will demand to know what his mom’s hiding. Dr. O will be under fire as Nathan pushes her to reveal the truth about his biological father. Alas, Nathan won’t have much luck with the shady doc. He’ll have to conduct his own investigation if he wants to get to the bottom of all this. GH fans can expect Nathan to make a crucial choice. On December 26, Nathan will decide it’s time to solve this mystery once and for all. General Hospital spoilers say Nathan’s efforts take him on an interesting journey. Will he regret digging too deep? Maxie may support Nathan’s decision, but she’ll definitely be worried. It’s important for Nathan to learn more about his past, but not if it risks his present and future. Maxie will be fearful, but Nathan will offer reassurance as his mission kicks off. Who’s Nathan’s father? How will the daddy drama shape Nathan’s character moving forward? Some crazy revelations are coming up. We’ll give you updates as other GH news emerges. Stick with the ABC soap and don’t forget to check CDL often for the latest General Hospital spoilers, updates and news.